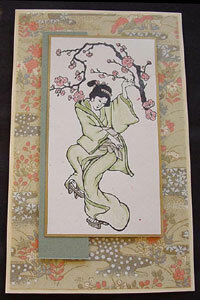 Stamp Asian Dancer on cream card stock with Memories black ink. Mask upper body and stamp Blossoms with same black ink. Color with pencils. Trim edges of card with gold pen. Cut a coordinating strip and place between card and background paper. Attach top card with foam dots. Using double stick tape, attach designer paper (we used Hero Arts Origami Paper) to matching card stock. Note: This is a long card and will fit into a #10 business envelope.